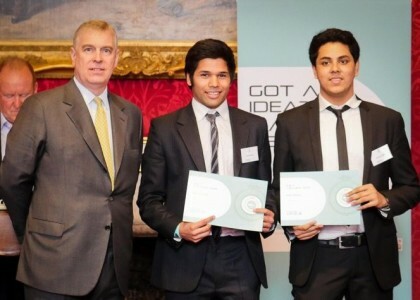 iDEA 2015 winners were announced at St James’s Palace this week and EECS student Soham Trivedi was there to collect his prize, from HRH The Duke of York, as one of the UK’s Finest Young Digital Entrepreneurs. The app he and a fellow student designed, Candle Path, plots the safest route home for the user by looking at a variety of data including street lighting, crime statistics and population trends. It works by using an advanced algorithm and open data and also has functionality to let a chosen contact know if you seem to be in trouble. They were selected as one of three winners of the prize after pitching to a heavyweight panel of industry judges from companies including Games Workshop and Facebook. On top of £15,000 funding, as winners, they will receive professional support from a number of iDEA partners including Microsoft Ventures, Barclays, Facebook to further develop their business ideas.